DJI, the world leader in unmanned aerial vehicle technology, Monday announced features and specifications for DJI Goggles, a first-person view system that opens up the sky giving drone pilots a seamless bird’s eye view of the world in full HD. DJI Goggles combines a pair of large ultra-high-quality screens, long-range and low-latency wireless connectivity, and direct control of photo and video capture. Operators using a Mavic Pro or Phantom 4 series drone can also access many intelligent flight features using a touchpad on the side of the visor. “DJI pilots deserve a first-person viewing experience with the same quality, power, and performance they have come to expect from our aerial platforms. 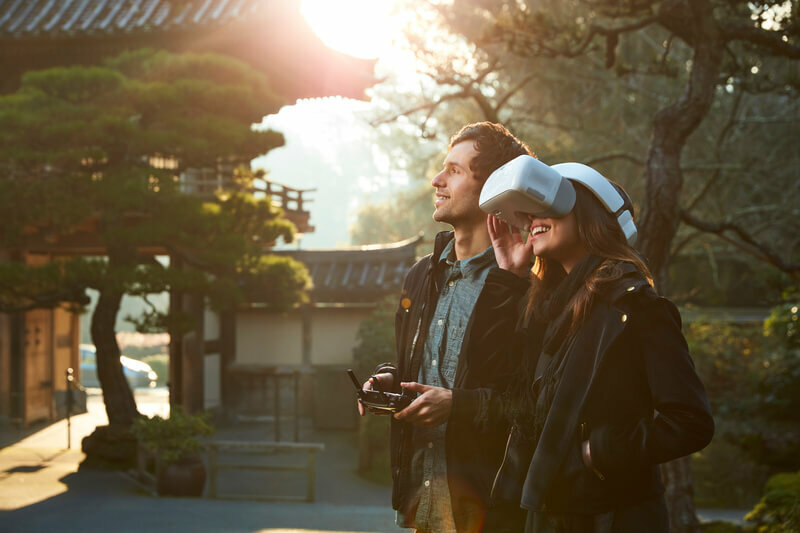 We fully expect that they will be thrilled with the fun and immersive experience of flying with our goggles,” said Paul Pan, DJI’s Senior Product Manager. DJI Goggles use a beam splitter to display an image in front of each eye, as well as polarization to prevent any image overlap. This creates full HD 1920x1080 resolution per screen, providing more than twice the amount of pixels of a typical 2K display. Wearing the DJI Goggles is like looking at a 216” home cinema screen placed about three meters away. Through DJI’s OcuSync wireless transmission system, up to two pairs of DJI Goggles can be connected to a single Mavic Pro aircraft. DJI Goggles can receive video data directly from the drone bypassing the controller to minimize lag. When flying with the Mavic Pro, DJI Goggles offers both 720p at 60 fps and close range 1080p at 30 fps viewing with latency as low as 110ms. Fully Immersive Experience. Total Control. A touchpad integrated into DJI Goggles makes navigating the internal menu system simple, providing easy access to key intelligent flight features such as ActiveTrack, TapFly, Terrain Follow, Cinematic Mode and Tripod Mode. In Fixed Wing Mode, DJI Goggles bring with them a whole new way to fly the Mavic Pro. In this mode, the aircraft flies forward with enough rotational movement to simulate realistic flight. An AR trajectory prediction feature in Fixed Wing Mode makes using this mode much safer in complex environments. Head Tracking, a feature on DJI Goggles, allows operators using a Mavic Pro or Phantom 4 series aircraft to use head movements to control both aircraft yaw and camera tilt. Turning your head is like moving the control sticks – turn left, or right to yaw left or right, and straighten your head to stop the turn. Another option is using DJI Goggles to control the gimbal exclusively, while the aircraft operator maintains control of the aircraft with the master controller. Combined with Fixed Wing Mode, you can use your head to control the Mavic Pro for an immersive flight experience. Operators should always follow local regulations for FPV flight, and it is recommended to use a spotter to help monitor the surrounding airspace. A stable headband design balances and spreads the weight DJI Goggles around the head, minimizing pressure on the face and maximizing comfort. DJI Goggles allows the operator to flick between third person view and FPV in a matter of seconds. Operators can even wear glasses inside and quit FPV mode instantly by flipping the visor up so they can see the aircraft and their surroundings. The screen and headband can be detached for ease of portability and storage. A range of interfaces are built into DJI Goggles, allowing them to work with different devices. DJI Goggles can sync with the Mavic Pro via DJI’s OcuSync transmission system, while the Phantom 4, Phantom 4 Advanced, Phantom 4 Pro, and Inspire 2 drones can connect via the controller’s USB port. An onboard Micro SD Card allows operators to download files from the aircraft to the goggles or review video files on the spot. 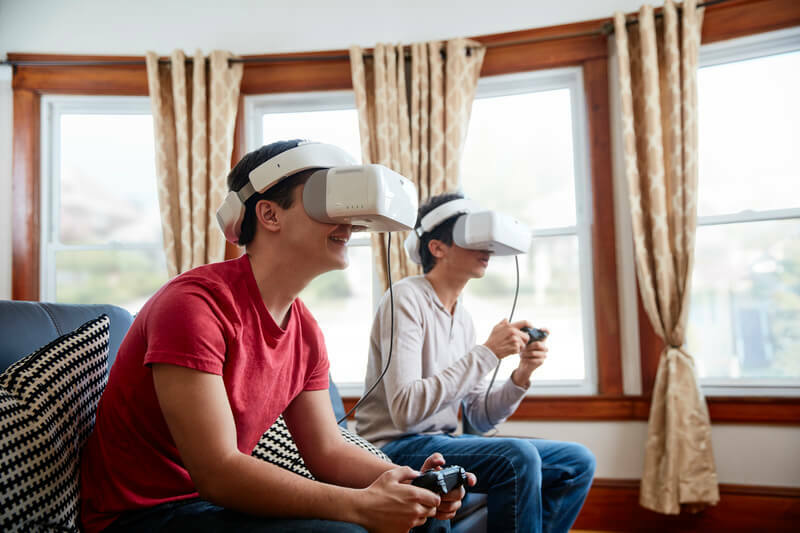 Additionally, the HDMI input allows DJI Goggles to connect to a video device for watching films and even playing video games. 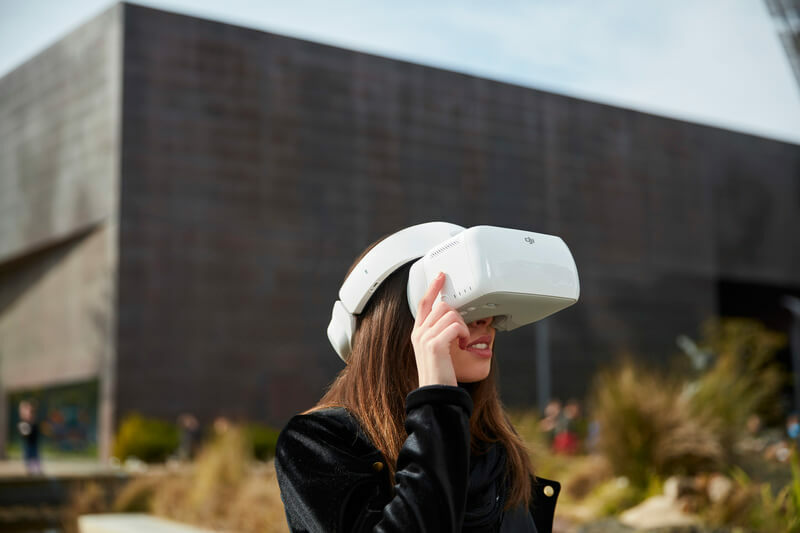 DJI Goggles’ first-person viewing experience works with DJI aerial platforms including the Mavic Pro, Phantom 4 series, and Inspire series (intelligent flight features using the touchpad vary with each model of aircraft). On a full charge, DJI Goggles are fully operational for a maximum of six hours. Priced at US$449, DJI Goggles will start shipping after May 20, 2017.